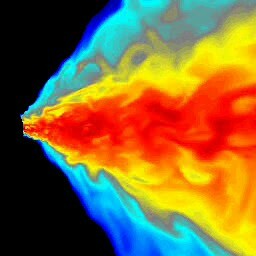 Computer simulations of how black holes accrete matter show surprising violence and turbulence, challenging many commonly held assumptions about the nature of this phenomenon. "These programs are opening a new window on the complicated story of how matter falls into black holes, revealing for the first time how tangled magnetic fields and Einsteinian gravity combine to squeeze out a last burst of energy from matter doomed to infinite imprisonment in a black hole," said Julian Krolik, a professor in the Henry A. Rowland Department of Physics and Astronomy at Johns Hopkins, and co-leader of the research team. Included on that research team are John Hawley and Jean-Pierre De Villiers, both of the University of Virginia, and Shigenobu Hirose, of Johns Hopkins. The team's first realistic calculations of matter falling into black holes has strongly contradicted many widely-held expectations. They have shown, for instance, that life in the vicinity of a black hole is anything but calm and quiet. Instead, the relativistic effects that force matter to plunge inward magnify random motions within the fluid to create violent disturbances in density, velocity and magnetic field strength, driving waves of matter and magnetic field to and fro. While most of the matter moves inward toward the black hole, some is thrown away, spiraling outward at nearly the speed of light, according to research team co-leader Hawley. In this simulation, the black hole is the semi-circle at the left-hand edge of the video. The red shows gas density 10,000 times greater than the deep blue. To download and watch this close-up view of the simulation, click here. To download and watch the entire simulation, click here. Another aspect of the simulation, the flow of electromagnetic energy, can be viewed by clicking here. This shows the entire simulated volume, but in a cut-away view. In this video, red shows where the flow of electromagnetic energy is most intense, blue where it is weak. The contrast is by a factor of only 100. To learn more about this, read the press release.